NOTE: Hi guys! I’m not from SSS. I’d love to help you answer your questions, but may not be the most qualified to do so. At the end of this post are links to articles you may refer to for additional knowledge. For more immediate clarifications, it’s best to contact your HR department or SSS directly. Check out these two links from SSS: Part 1 and Part 2. Our HR department provided this form for me. You can also download it from the Gov.Ph website (Maternity Notification Form). NOTE: It doesn’t say so on the form, but I also needed to show my original SSS digitized ID and a photocopy. Have that handy. If you’re a paying SSS member, you have a right to avail of the maternity benefit. More specifically, you have to have paid at least 3 monthly contributions within the 12-month period right before you give birth or have a miscarriage. You also need to have filed the maternity notification form. The maternity allowance is equal to 100% of the member’s daily salary times 60 for normal delivery or miscarriage, 78 for caesarean. Do ask your employer about policies and benefits. Some employers require a medical certificate. Talk to your boss about your situation. And if your company is new-Mom-friendly, good for you! I once worked for a company that allowed new Moms to go home at 4.30 pm – much earlier than the usual time-out hour. Check out what benefits your employer offers. Now how do you go about claiming your maternity reimbursements? How does one file maternity leave at work? I’ll share my personal experience with you when THE day is nearing! Meanwhile, you can check the helpful links below for more details. And if you have tips to share, please feel free to leave a comment. It’s great to learn from one another. I hope this helps you moms-to-be! things you’re bringing to the hospital. Hope the pregnancy is going well! Thank you for the tip Giselle! I’ll prepare another entry on Philhealth requirements when I’ve gotten my stuff together. 😀 Many thanks! same issue as mine. I did file maternity benefit on my previous company but it was denied. originally may expected date should be may 11 2015 so our HR said it was not qualified because of the 6 months contribution. so that is the reason of denial . turns out that I delivered my son on June 11 2015.
can I still file for my benefit? I don’t understand why you were denied access to benefits, the minimum contribution required based on the info on their website is just 3 months. So far this is how I understood, if you delivered either May or June 2015, you should have a contribution of at least 3 months between January to December of 2014 so you could file for a notification and for a claim afterwards.. This is the answer i’m looking for. I’m also not sure if to too na 10 years. I got separated from my Company April 2016 i gave birth August 2016. I was able to submit my SS notification but since i moved in Canada, hindi ko pa nasusubmit ang claim form. Do SSS require the Certified True Copy of Birth Certificate or Do they acknowledge the photocopy of the Certified True Copy with stamp ng Philippine Embassy ditto sa Canada? pano po gumawa ng maternity notification letter, its been 3 yrs. na po kasi. makaka avail pa po ako ng SSS Benefits Kahit na Last Yr Ng Stop Ako ng Work Since January 2016-September 2016 then ng Work Ako Ulit May 2017 Na stop Hulog Sa SSS Ko Ng Ilang Buwan Pero Continue Na sya Sa New Employer ko Then This Oct.2017 Lang Nakunan Ako Makaka Avail Ba ako Ng MAternity Benefits?? Hi ask q lng po hnd q po kc alam ang about sa maternity loan my 4 kids po aq my 11,9,7 at 4 yrs old pwde pb q mag avail ng maternity loan? yes same lang un, pero matagal mo bago makuha unlike kapag employed. Pwede pa bo ba mag claim kahit nakapag file na po ko then yung due date po ng babayadan ko is december 31 whch is holiday and nanganak din ako ng araw nayan then tunagal pako sa lying in ng one week kaya d ako nakapag bayad agad ngayon mag one month na baby ko pwede pa po ba ko mag apply ng maternity benefits po? Hi po. Nanganak po ako dec.19,2015. Nag start naternity leave ko is dec.1 pero pinapa work pa din ako ng boss ko if may employee na restday or absent, then may sahod pa din ako sa leave ko kaso hindi kasali sa salary yung days na nasa hospital ako at mga holidays din walang sahod. Ask ko lng po if pwede ko pa ba ma claim maternity benefit ko… Pls help naman po. Nkapag file po ako ng maternity notification last nov. 2015..
My name is Rhen, 28. I’m a single mom. I had cryptic pregnancy kaya I was not able to file MAT-1 sa SSS. I found out that I was pregnant a week before I gave birth, and that was a month after I resigned. Am I still eligible sa Maternity Reimbursement? Someone told me kase that SSS might deny my application kase wala ako na submit na notification. Is there a way na maka kuha parin ako ng maternity benefit? I need the money for my kid we are suspecting that he has inguinal hernia and I am currently unemployed yung sa SSS Lang ang inaasahan ko for my son’s check up. Hoping for your response. Thank you and God bless! Hi Toni, I gave birth to 3 kids now aging 9, 8 and 4. I wanna ask if I can still get my maternity benefits though they are on these age? I wasn’t able to get any of it eversince I gave birth. I have been working since I’m 16. And still working as a call center agent. My colleagues just advised me of this benefit. I honestly don’t know anything about this and other loans that I may take advantage of. No Pag-Ibig loans or SSS loans at all… Looking forward for a response. I really wanna know so that I can file it, if I can still do so. With my experience last year, with my first kid di ko na nakuha ung benefits kasi you can have it if you file your maternity leave before giving birth. just wanna ask nagsimula kasi ng february contri. ko sa sss. then sept ako manganganak sabi ni employer d daw ako makakaavail ng mat pay? Pwde pa po ba akong mag submit ng maternity notification kahit na 6months na akong buntis? Yes you can avail the mat pay since it is stated that at least you made 3 months contributions to SSS. Hi, ask ko lang if naaaprove ka padin kahit na 7th month ka na nagfile, ung sakin kasi 8th month na nafile ng employer koung mat1. SO di ko sure kung maaaprove or what. Toni, Philhealth nowadays require Membership Data Record, so you must get that file before you admit yourself to the hospital come delivery time. Correct! I’ve requested for a copy from our HR already. Even though delivery is months away, at least that’s one requirement down already. I’ve never claimed any maternity benefit from SSS yet but here’s what I know…In the past, the SSS benefit is 2 months salary or maximum P30,000 (for normal delivery – 3 months for CS but I’m not sure how much is the maximum). I am also not sure if the maximum P30,000 is for those who have maximum contribution. Depending on you employer, SSS benefit is usually not on top of your salary thing! Most employer just pay the difference between the P30,000 and your total of your two-months salary. Daya no? But check with your company and you may be the lucky few who gets their SSS benefit on top of their salary. Now, to simplify the process it is the ususal practice for the employer to just continue paying your salary while you are on maternity leave and they will take care of the SSS reimbursement so as not to hassle you. I’ve been away from the country for 5 years already so I don’t know if things have changed but the last time I talked to the SSS rep here, the maximum benefit is still P30,000 for normal delivery. Hope this helps. Thanks! Will double-check SSS reimbursement benefits vs. salary with employers. And I have heard that some employers continue paying an employee’s salary and take care of SSS reimbursement on their own. It varies from employer to employer though! This is really helpful. Thanks a lot Nina! is there a paternity benefits? Shows how ignorant I am, but I didn’t know that the Philippine government gave maternity benefits? Or does this have nothing to do with the government? It’s part of the government; Social Security System. As already mentioned above, a lot of companies just continue to pay you your 2 months’ (or 2.5 months for CS) salary while you’re on maternity leave and then they just claim the reimbursement (P30,000 max) from SSS themselves. If that’s the case with your company, then you don’t need to do anything. Yung company mo na ang kakausap sa SSS. Some companies are more generous, though. They give you the 2 months’ salary from their own pocket, and then allow you to keep the SSS reimbursement (maximum of P30,000) for yourself. In which case, you’ll need to make the claim of the extra P20,000 yourself. By the way, don’t forget: your newborn baby is also entitled to Philhealth benefits!! This is important, because a lot of moms don’t know this and they only claim their own Philhealth and forget to claim Philhealth for their babies. If your baby is perfectly healthy, mga P1500 lang ang pwede niyang iclaim, but if your baby has complications Philhealth will pay for more than that. Also … bear in mind that when you leave the hospital after giving birth you’ll be paying for 2 hospital bills: yours and your baby’s. So don’t just save up for your bill, also set some money aside for baby’s! Yes, when you go in, isa ka lang, pero pag labas mo, dalawa na kayo. rowies last blog post..Childbirth classes. THIS IS SUPER AWESOME ROWIE! Thank you. I’m waiting for our HR right now, and I’m looking forward to clarifying some things with her. My old company used to shoulder the 2 months salary and settle SSS themselves, so I want to know if the same applies here in this new company too. I have a question about Philhealth for the baby — is any paperwork needed for the wee little one? Or is that part of the Maternity Care Package forms that Philhealth has already? 2 hospital bills! That’s right. Thanks for that reminder. And oh … thanks so so much for the link! You’re welcome! I hope your site reaches more and more moms-to-be! wow..that is awesome that you are getting compensation! despite it being a super-power, the U.S. is still behind on family benefits! we get time off, but we don’t get paid! by the way, here’s a tip to maximize your “normal” clothing (as opposed to switching to maternity clothes right awa): get a belly band! i’m pretty sure they have a version available over there. i used mine (and my normal clothes) up until i was 6 months pregnant! This is awesome hahaha. I’m wearing a belly band right now! I’ve been meaning to write about it but just haven’t gotten around to having my picture taken with it yet. It’s really awesome! I haven’t bought any maternity clothes yet. Will just do that when I’m really running out of clothes. Gotta save save save! Hi toni. As a government employee, I filled my maternity leave one month before my due date and accomplished a clearance form immediately after the leave was approved. About the reimbursements, I was not able to avail of that. I stop my SSS contribution as I start working in the government because we are required to pay and be a member of the GSIS. Though I still want to continue paying my SSS contribution it is very hard for me to pay GSIS & SSS at the same time while I am also required to pay on my Pag-ibig and Philhealth contributions. Just a piece of advice, I got from my friend about the philhealth claims. Apply for reimbursement directly to the philhealth office rather than let the hospital deduct it from your hospital bill. Mas malaki daw ang marereimburse mo kapag diretso kang nag-apply sa philhealth samantalang konti lang ang binabawas ng hospital sa bill kapag sila pa mag fill ng claim sa philhealth. That’s really helpful. Thanks Blue Rose! Toni: as far as I know the paperwork for baby’s Philhealth is separate. Actually what happened with Rafa as that the Philhealth woman in the hospital who brought me the Philhealth papers didn’t know that babies are supposed to get Philhealth benefits too. But I was pretty certain about it so when I got home from the hospital I called Philhealth and the Philhealth office gave me the list of requirements that I needed to submit to be able to get a Philhealth reimbursement. The reimbursement check arrived around 2 months later. I’ll pass this on to my friend. Thanks for sharing. Oh man, where were you when I was pregnant? ;p I should’ve read this before I gave birth! * fill up M2, attach birthcert of your baby, ask for an ER2 from HR and submit (M2 with ER2) to the nearest Philhealth office so you may be able to get MDR indicating the name of your baby as your qualified dependent. philhealth benefit is up to 30% of the total bill. This is SUPER helpful. Thank you Renin! My wife is out of work since June of 2008, and simultaneously contribution for both SSS and Phil Health ceased as well. But since she is pregnant now and baby is due this September 2009, what proper steps we need to take inorder to avail maternity benefits for both SSS and Philhealth. Any inputs is sincerely appreciated. Hi Ray! I think it would be best to give your nearest SSS branch a visit to get an idea on next steps. I hope everything works out. Good luck! Pwede ko pa po ba maclaim ung maternity benefits ko kahit 2 months na nakalipas ng panganganak ko..
hello i would like to ask anybody,,how to compute the maternity benefits of a employer?my bookeeper told me the maternity claims will be based on monthly contribution daw?is it true? Please go to the SSS site (see links above) for the computation. Or give them a call? Best to get the info straight from the source. i just wanna ask what are benefits in MAT-1 and Mat-2..
i had filled-up my MAT-1 before i had given birth to my 1st baby last Sept. 2008.
and i had recieved cheque 17K from my company..i was on maternity leave for 2months..
then last March i had filled up MAT-2..does this mean i will recieve another cheque from SSS?? I think it’d be best if you go to your nearest SSS to get the correct information. I tried searching for answers on the net for you, but am unsure of its accuracy. You may want to check out this thread for some information. But I’d still advise you to give your nearest SSS a visit. I just have a problem with regards to my SSS,and I really need your help and advice! 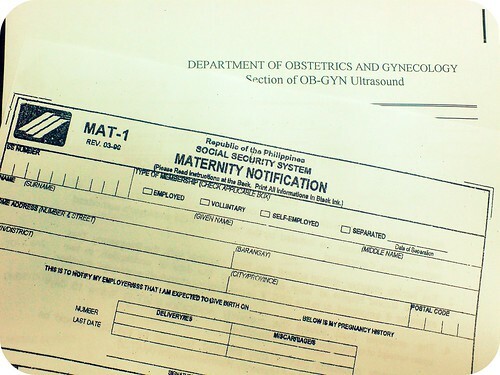 Im 6 months pregnant now and I want to file a maternity leave, when I visited nearby SSS office and check my sss status I found out that my previous employer in which I have work for 9 months – April 15 2008- Jan. 19 2009 has failed to remit my sss, I have resign their and now currently working in a small office in which there is no sss benefits and I decided to continue my sss through voluntary but how can I when my previous employer failed to remit my sss.? Is there anything I can do to still avail maternity leave? I have already called my previous employer and they said its still on process and I dont believe that…because they keep on promising they will remit it and until now its 000…I really need your help.. Try niyo po munang tumawag sa SSS, di ko sigurado kung paano ko masasagot ang tanong ninyo. mg file po kc ako ng maternity,kso un ultrasound result k wla ksama n pic. ok lng po b n un ang i-submit k s sss? Okay lang kung walang picture, importante yun ultrasound report. Hi. I just filed MAT2 2 weeks ago and I was informed that i’ll get my cheque after 2-3 weeks. I just wanted to know how really long before I receive my cheque? Please help. I dont know if im still qualified for the SSS maternity benefit. i have my contributions at SSS for about 13 months. The problem is i have just started working again a month ago i resigned to my company and just as well started to receive the basic salary and have it deducted for my SSS. Im 3 mos. preg and it says that i shall have at least 3 months contribution. I dont know my status if i still pursue for this one. But i would really love to and really needed that benefits. Please answer. Thank you. At the back of maternity notification [MAT!] it says that it should be submitted together with the maternity reimbursement [MAT-2] 60 days after conception. What should I indicate on the MAT-2 regarding the type of delivery (normal, CS, miscarriage) if I am still on my 2nd month? I don’t think you give the MAT-2 till AFTER you give birth. Hi, Good evening! i just want to ask you regarding my problem with SSS reimbursement! I gave birth sept 2009, i filed for the notification july 2009 and after that my company gave me 15,000 in advance.. I filed for the reimbursement dec2009. Now, they told me that according to SSS i am not qualified for the maternity reimbursement since i lack 3 months of contribution from april2008-march2009… I am puzzled how they came up with that months of contingency (i think?!).. And worst, my company is asking me to return the 15,000 they gave me in advance or they will deduct it from my salary… Do i have the right to refuse from deducting the 15,000 from my salary since it is not my fault anyway? They should have verified first from SSS if i am qualified or not, right?,, well, i hope you can help me out with this one, thanks in advance! Uh oh, but is it factual that you missed out on SSS contributions? Because if you did your company could take back the 15h they loaned you. I just filed all the needed requirements to claim a maternity allowance 7 weeks ago and I was informed that i’ll get my cheque after 5 weeks.and im just wondering that it almost 7months still i didn’t receive the cheque. I just wanted to know how really long before I receive my cheque? Follow up! You’re supposed to have gotten it by now. I have question regarding the unused maternity benefit…I am employed and i just deliver by CS section. i reported for worked after my 60day leave which is supposed to be 78 day leave. Can I claim for the 18days left with SSS? and should my employer pays me for that 18 days I reported for work? Not sure about that, please check with the SSS office. Thanks! Hi, i am an sss member, i resigned from the company last july 2002 and i got pregnant nov. 2002 and give birth last july 2003. I didnt file any maternity benefits because i was doubt if i can avail until now 2010. My inquiry is that can i claim or file my maternity benefits even if its past six years? This site becomes good and they given a lots of information here good dear keep it up. I just want to ask..i filed for my sss maternity benefit last dec ’08 and gave birth last jan ’09. however i forgot/wasn’t able to file for the mat2 form till now due to lack of time. (self-employed kasi ako) My question is, pwede ko pa ba ma claim yung benefit ko if i filed now? thanks…. Hi, I have a friend who works in a company and she has filed her Mat-1, given birth etc. She’s asking though that since she’s on maternity leave, does the employer stop paying SSS contributions? Or does she have to file payments herself during her maternity leave? almost 2 yrs. n po akong nghuhulog ng sss voluntary member b4 i gave birth to my 2nd child pro un plang po ang first time n mkaclaim ako ng maternity kya lang po 8,000.00 lang po ang nkuha ko eh sbi po ng iba supposedly 20,000 or more po ang dpat kong mkuha.. pano po kya ngyri un? Hi, Your post is very nice, Because your post is giving nice information. So i m very glad, Because you have given this information. So very thankful. hi! I’m separated from my company since June 30, 2010. My concern is can I still use my Philhealth even if I don’t have any work right now? I’ve been working since 9 years already. I resigned this June 2010 due to sensitive pregnancy. I am a single mom. Your response will be highly appreciated. Thank you 7 hope to hear from you soon……..
gud day! i was submit all the rquirements to the sss nearest branch…i am employed but my employer did not advance my maternty benefits. they told me to wait the check from sss and give to me. But it is almost two months of waiting the checques. until now im still waiting. How many days will the sss give the cheque to my employer so that i will also claim my maternity benefits? I think it’d be best for you to follow up your employer. You’re entitled to that benefit so make sure you get it! It’s best if you contact your own employer, Richelle. Good luck! Hi Im ashley khate po,ask q lng po when I was pregnant on my Ist baby di po aq nakapag file ng mat-1.dq po kc sure kng mkakakuha aq ng benefits.pero this year q lng po nalaman n pwede parin mkakuha ng maternity loan kht 2 yrs old n yun baby q at least 7 yrs.old.22o po b un?thanks po pls answer my question? hi i just want to ask kung pwede pa ba kong mag-file na maternity benefits kung nanganak na po ko last year,august 2010? di ko po naasikaso ang sss ko kasi naging busy po kaming mag-asawa that time..
hi! i wanna asko kung pde pa kya mga file ng maternity loan even im abroad? plus i just found out that im 15 weeks pregnant na.i have a medical report from my doctor indicating my pregnancy. ngwoworry lng ako kc ang requirement e atleast 60days conception. can i just print out the downloadable form on the site & have my mother file it for me in the phils? hello! i am a member of sss just last january 2011. i am 2 months pregnant now. can i still avail the maternety leave? Hi! It’s good to see this informative site. I’m also an expecting mother (for my 2nd child). I resigned from work last year and failed to continue paying for my SSS contributions. But when I learned that I’m pregnant pala last Feb 2011, I went to SSS office to inquire if I can still continue to pay for my contributions and at the same time, be eligible to avail of the maternity benefit. Pwede ko pa raw naman habulin if I pay for Jan-June 2011 since I’m due on October pa. I already paid for Jan-Mar and will pay for Apr-June by July (quarterly payment). I paid for the maximum contribution as voluntary member kase I want to get the maximum benefit sana. But is it true that if there is a salary loan, ideduct ba nila un sa maternity benefit na makukuha ko? May loan po kase ako when I was still employed and I was not able to pay for it na after my resignation. I hope someone can provide me an answer if the loan amount will be deducted from my maternity benefit or not. Thanks! Good morning. I am working abroad for nine years now. Got married on April 2011 and 2 months pregnant now. My husband is in Philippines. I paid SSS monthly contribution for 34 months from year 1999 to 2002. Is it possible for me to claim for maternity benefit? Furthermore, I will be delivering my baby here in Bahrain. I hope you could help on this matter. How many contributions should I need to have mat-1 for SSS? I had miscarriage September 2009. I filed mat-1 on October 2009, my expected delivery date was March 2010. I have worked for the company for 5 months then which means I only have 5 months contributions. They gave me the the half of my benefit. I was not able to file mat-2 since I was not aware that I still need to file for it. Last April 2010, they told me to comply my mat-2. I waited for it for almost 2 months now. Then they told me that I am not eligible for mat-1 and mat-2 since I had insufficient SSS contributions during the required period. Now, they told me that they will deduct the amount of my mat-1 to my salary. they told me that my miscarriage date does not suffice the 12mos. period prior to the semester of contingency. I really need some help here. Can you tell me if I should get mat-1 and mat-2 with 5 months contributions when I had my miscarriage? two months pregnant employee, but Needed to resign cos of personal problems with the father of the child. 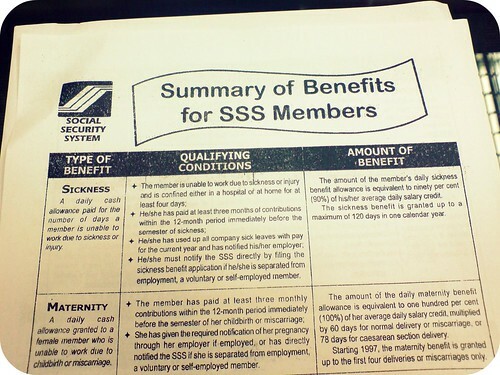 Am i entitled to maternity benefits from SSS? Can I ask my employer to advance the said benefit even if I voluntarily resigned from them? A plesant day.nakapag file na po ako ng maternity ko last july 13 2011,may I know kung klan ko makokoha checke ko kc pumunta ako sa sss diliman branch ang sabi sa akin wala daw eh kumplito naman po ako ducument na pinasa.thank you po!!! Can i return to work 2 weeks before the 78days maternity leave ends which was paid by sss via sss mat benefit. Tnx a lot! pano kapag ayaw mgbugay ng dating employer ng L501 which is 1 of the needed requirement s mat2,,,ang ibinigay lang nila ay sss cotribution,,,pwede n b un??? ?pls.email and pls.answer this question,,thanks. I have a contributions in SS for six years since 1995 to 2000, was not able to continue my contributions, and never been availed my maternity benefits in my first child, can I file a maternity benefits for my second child (she is one year old now) Someone told me po kc ok lang daw magfile kahit matagal ng nanganak at basta may contributions sa SS. Please help! good day..ask ko lang po, kasi po isa akong private employee, ngayon po due ako in 2-3 weeks time… bale po nung nag inquire ako sa head namin sabi nya ndi daw po ako pwede sa maternity benefits kasi sa last employer ko 2 months lang ako nakaltasan sa bago naman po 5 months lang so 7 lang lahat ang contributions ko… ngayon naka leave na ako, sabi nang iba pwede ko daw magamit benefits ko kasi ung iba 5 months lang sila nakahulog pero may nakuha sila… may makukuha po ba ako kapag nag apply ako kahit nakaleave na ako? thanks…sana po matulungan nyo ako..
Hi po. I gave birth last october 11 and true enough my company advanced my maternity benefits of 30K (CS po ako). I’m still waiting for my daughter’s birth cert to give to my employer so that they can process the reimbursement from SSS. I am due to come back to work this December, but unfortunately I believe I cannot continue to work and was hoping to focus on my child before I go back to the workforce. Can i resign even after i have received the advanced maternity benefits provided I will comply with the requirements for the company to reimburse it from SSS? Or should they ask me to pay the 30K before I resign, and I shouldered 30K personally, can I personally continue to process the reimbursement from SSS so that I can still attain my maternity benefits? I do hope for your immediate response. I would like to know if I should pay for it after? I am a voluntary SSS member & I applied for an emergency loan last September. Currently, I am paying for my loan & monthly contribution. Also, what do I need to present to SSS office should I go there this week? Hoping for your soonest response. i gave birth last 11-11-2011 but until now no maternity benefit received? The HR staff incharge says they are too busy that’s why they cannot worked on my maternity benefit yet. Is this allowed? What can i do with regards to this? Im expecting my fifth child this august,and they said i cannot claim for any maternity benefits,since its only up to 4 child.Since,I will be out of work for 2 months,will i get anything at all? I want to ask if im entitled to file for sickness notification,instead?will i be getting anything at all?thank you! i resigned in my previous company last sept 2, 2011. I got employed last september 16, 2011 with my new comapany. i am now 3 months pregnant? who will pay for my maternity leave? is it my previous employer or my new employer. Gud morning po. I gave birth July 12, 2010 and I apply my mat 2 last April 2011, the Bago Branch receive my application other than they told me that my papers are lack. Then I process it, I pass all the requirements to Antique branch. but then until now I didn’t receive anything from your good office. Meron pa ba akong kulang sa requirements q? I have heard from a lot of individuals and families lately that they are having trouble finding good maternity insurance. If you need help finding a maternity insurance plan, please let us know. In the U.S., there are not a lot of options, especially if you are already pregnant. We are here to help you if you need. hi ask lang po ako kung pwede ako na ang mag process na maternity ko kahit employed ako. kasi gusto nang employer namin na ako lang ang mag process. fist time kopa magclaim nag maternity? One of the many advantages to exploring careers in various employment placement agencies is that you will find that it normally does not take a four year degree to acquire employment. Normally, in order to acquire a position of employment placement agency in, you will simply be required to submit proof that you have graduated from an accredited high school. However, it is important to know and understand that many administrative or specialized positions within the agency may require you to submit proof that you have Obtained a higher form of education. I just have a question. i am a vonluntary member of SSS and one requirement for availing the maternity benefit is to have a copy of approved SS Form E-5. now my question is what is ss form e-5? I tried to research it but failed to find it. i hope anybody could help me on this, im currently out of the country but voluntarily pay my sss contribution monthly and i am now 7 months pregnant and i need to submit the requirements before my due date comes. thank u so much in advance for the help. Im actually on my due date and already filed Mat-1 in my company,I was married but I dont have sss I.d and as per my employer they need my sss id as a requirements to claimed my maternity benefits. Is it possible to have my sss i.d as Single just to claim my benefits? I have my E-1 form and its indicating that Im single. hello, good fay!. I am four months pregnant now but has no yet informed my employe about my pregnancy. I am already 3 months plus when I knew about my pregnancy, it is because, from the previous moths/years, I had always a unregular menstrual period that takes 1-2 months of missed period. At first, i think that it was just a missed period, due to my non regular menstrual periods, and i will have back my preiod the next month, but since I didnt have the following month I decided to undergo a home pregnancy test, and discovered that I am pregnant. Would it be too late for me to inform my employer regarding this, and be able to avail the maternity benefits? As stated on the rule, one must informed the employer :for at least 60 days from conception” and I am 4 months now. Please do answer my querry. I badly need your opinion.. Thank you so much. hi gud day .. pwde pa po bang kumuha ng maternity pay sa sss kahit 2 months na po akong nanganak?? may contribution po ako nung nov 2011 hanggang april 2012 ..?? gud day! i did not not file MAT-1 but i filed MAT-2, can i still avail my maternity benefits? gud day po aq po naun pa lng mgfile ng mat 1 kaso hnd ko pa po alm ung mga requirements ano po ba ung mga kailangan 1st tym ko pa lng po kc …. Good day! Hangang kailan po pwede kumuha ng sss maternity loan 1month ago na po ako nkapanganak..Hindi pa ko nakapag file. varify ko lang po f nakapagsubmitt na po ang mcmv ng maternity loan para sa pinsan kong si connie grace retoya sss no. # nya po ay 0725530428 agency nia po ang mcmv ladyguard po cia ng sm savemore. my lasy employer does not want to issue L501 for my maternity requirement. I am unemployed and is self voluntarily accomplishing my sss contirbutions….what do i do? Im currently employed but nagpapacheckup ako sa isang goverment health center, and theres no OB sa center na un, so ang pumirma nung Obstetrical History Form ko ay ung physician lang ng center or NON OB na doctor…. Magkaproblema po ba kya ako sa pagfile ko? sa website. i dont even know kung may makukuha ba ako before i’ve giving birth? yong benefit na makukuha ko, if ever na meron po?? hi pwde po ba mg ask pg hindi naclaim ang maternity benefit anu po gagawain?? kasi narts ang check back to manila.. pwde po mareplace another check? hi, can I still file maternity notification even if i have existing loan with sss? hoping for your feedback on this. thanks.. Ask ko lng po..after po ng miscarrage.,,until ilang days po ba pwdng mg file ng mat2. i have a question hope you can help. temporary pa po yung number/membership ko sa SSS since I’m still having problems with my birth certificate and baptismal certificate. Is there any chance po ba na ma-avail ko yung maternity benefits ko kahit temporary member pa lang ako? hi, ask ko lang kasi i checked my SSS online, nakita ko na na meron ng checke yong maternity reimbursement ko, wait ko na lang ba yong cheke sa bahay ko o pede ko na syang iclaim? i just would just like to ask if you would have an idea on what i can do. i had a miscarriage and i was not able to file for mat1 and i was already bleeding even before i was able to get an ultrasound. my ob and officemates said that i can still avail of the sss mat benefits. i just dont know how to go about it. i would really appreciate your help and your input. im currently employed – hired last may 13,2014 till present I already check my sss contribution I currently have 9 months of contribution ( not including feb) can I avail for maternity benefit ? im already at 6 months pregnancy coming 7 ? can I still file for the maternity notification isn’t it too late ? what steps do I need to do ? on the day of delivery do I need to present something ? or what ? please help ! I give birth last Aug. 8, 2013 but prior to my pregnancy & labor, I didn’t pay my sss remittance….I only had work last feb. 2014 but 1month only & work again by Sept 2014. Can I still claim my maternity benefit? Hi Ms.Toni, hope you can help me. Can I still avail my SSS maternity Benefits for my five (5) years old son. Since I was employed on my previous company last 2009, I was unable to have thier CERTIFICATE OF EMPLOYMENT as one of requirements for claiming my benefits because I got AWOL from their company. I have no certificates from them and maybe because I was employed less than 1 month.But I was employed after 7 months of my delivery from June 2010- May 2011 and another company for 2012 up to 2014,and now Im currently working. What should I have to do to continue pursuing my Maternity benefits for my son?? I really hoping for your quick response!! Hello, i hope you can help me. I couldn’t find info on the SSS website. I discontinued my SSS contributions since I left my job 5 years ago. My employed husband has declared me as a dependent under his SSS #. Can i also claim for SSS maternity benefit? His company continuously pays his monthly contributions. Do I also get the same maternity benefits? I didn’t able to give MAT-1 Notification to SSS by my employer because I didn’t know I have to. But my immediate superior knew that i was pregnant after i have the first ultrasound. But they didn’t able to gave the information to our HR. Also I wasn’t able to do it myself because i was advised to have some days of leave due to my bleeding. Then after 2 weeks i got a miscarriage. Now I did gave my employer all documents needed, Mat-1 & Mat-2, and explanation letter why I didn’t able to send Mat-1 right away. With late Mat-1, does my application can still be approved? can i still claim my maternity benefits? Glad i have red your blog. I just want to ask can i still get my maternity benefit for my 4 years old son? HI. I miscarried my 3rd baby, and when I gave birth to my 4th daughter, I stated on MAT-1 that she is my 3rd baby cause I don’t know that my miscarried baby was included on the list. Later did I know that my miscarried baby is included. When I filed MAT-2, I stated there that my daughter is my 4th child. Now when I’m trying to avail my maternity claim I can’t cause the details were mismatched. What should I do? If I’m going to make a letter, what should it state? hello,i hope that you can help me too.they said that i can still file my maternity loan for my 2nd baby even thou she’s already 8years old. ?how can i filed it..?thanks..
Mam pwede din po ang Affidavit of Undertaking. Yun po pinasa ko sa SSS kasi dhil di din po ako makakuha ng L501,. Naapprove aman po ang application ko po. i have 5 months contribution this year i will have my baby on november. But the sss said taht i cannot avail maternity benefit. Because I should have paid my sss contribution last april and may this year . can I pay it voluntarily to avail sss maternity benefit ? Hello, ask ko lang po. I gave birth last aug 2015. There was a problem with my sss by then that’s why i haven’t got any cent until now. They were able to fix the problem this late october and I was able to pass every document needed for my reimbursement. I’m still waiting until now, how long will it take po ba?c Oz I plan to resign this november, if so, will I still get my reimbursement from sss? Ty. I gave birth to my first child in 2011. I was able to claim my maternity benefit just 2 days ago. I didn’t have mat-1. They just asked me to fill out the mat-1 then submit the ff documents: OB History form(They will accept it even if you get it from an OB other than the one who facilitated your delivery, NSO/CTC of Birth certificate, Certificate of separation from employer (if you got separated from your employer before you gave birth), certificate of no maternity benefit advancement (from previous employer), Mat 2, OR room record (if CS), LS501 form from employer (signature card), photo copy of 2 valid IDs. That’s all!!! I mean, L-501 ata yun, basta signature card yun… In just less than 3 weeks, my claim was settled and now I am waiting for my cheque to be delivered… Yay! Hi po. Ask Ko Lang po kung parehas Lang po BA Yong mat1 for maternity leave and mat2 for reimbursement. Sabi Kasi Nong coordinator Ko Sa work, yon na raw Yong benefit na makukuha Sa mat1 and mat2.. Gusto Ko Lang po Sana Ng malinaw na sagot. Salamat po Sa response. God bless..
hi panu pag na dinied ung file ko sa maternity sss ko kc kulang sa requirements,? pde ko pa po ba ma file ulit ung sss maternity ko pag nakompleto ko n requirements ko!? thank you!! ask ko lang po kung pwede ba akong kumuha ng Maternity benefits kahit unemployed po ako. pls answer. thanks in advance. ask ko lang kung pwede pa ba ako mag file ng maternity leave kahit nakapanganak na ako. wala kasi nag ayos sa company namin. Makakakuha pa ba ako ng maternity benefit? need your answer. pwede pa bah akung mag submit ng aking MAT2 OR maternity leave kahit na 7 buwan na ang baby ko …..
please tulungan nyo po ako…. hi! tanong ko lang kung pwede p ba ma claim yong maternity benefit if i failed to comply requirements when i gave birth 5 years ago..my friends said na as long as d p umaabot ng 11 yrs old yung bata pwede p..s dat tru? accepted naman po yung birth certificate nang baby ninyo basta naka certified true copy siya sa munisipyo ninyo. Pag po 6months lang ang hulog mga magkano po makukuha? Hi mommies! I gave birth 27JAN16, but the daddy is OFW so wala pa kaming live birth cert kc di pa kami kasal. so mgpapa late register kami. so my question is can i still claim for reimbursement even walang birth cert? or can i still claim 4 months after delivery pag meron na kaming birth cert? Ask ko lang po, due date ko po base sa ultrasound ko ay April 11, 2016. Hindi po ba, nakukuha ang maternity benefit 1-month before the due date? O 1-month before your filed leave sa company? Help naman po. kasi sabi ng employer ko na before daw po ng due date. anong petsa na po kasi. thanks po. Good day po,1st tym ko po mgpa check up doon ko din po nalaman na nagbubuntis po pala ako pero sad to say po eh ectopic pregnancy po pinagbubuntis ko po 2 to 3wk.dahil po dun Hindi npo ako nkapag file ng MAT1 kc po nun time na pagpa check up ko un ndin po un time na inoperahan po ako ksi my internal bleeding npo.after how many days mkarecover po sa operation pumnta po ako sa branch ng sss MAT2 po binigay skin ,ask ko lng po kung OK lng na di ako nag file po ng MAT1? ?or my tendency po na ma deny ang maternity claim ko po??? April 4,2016 po ako nag file ng MAT2. my due date will be this month of may.. i had submitted my forms to our HR last march 15 , till now they haven’t notified SSS about my pregnancy.. I was asking for an update about my papers when they told me that they were taken aback daw knowing that i will be having my due anyday,. My question is, if my MAT1 will not be submitted till i give birth will i be able to get the compensation or reimbursement of my maternity leave..
Tanga kasi HR namin eh.. pinabalik balik ako dahil may kulang daw sa requirements ko.. nkakabwisit nah! Hi..i have a question po..im 7 months pregnant po now.. can i avail maternity benifits. ?but hindi na po ako nkpghulog since august 2015..? Good day to you all of you my name is Christopher Miles, I’m from USA, Texas, am very happy as am writing the testimony how i got my loan from this loan, i believe God has a plan for me, after i was been scammed of my money by many so called loan lenders, i was deceived and almost thought to take my life, but God has a purpose for me, if you want to get a loan from any company you have to chose Mike Johnson Firm, when i was first started with him, thought he was like the rest, and to my Greatest surprise i got the loan of $69,000.00 in my account and that was the Exact amount i applied for in his company, and you that is feeling that there no hope for you? is a lie because if you interested in getting any type of loan, you can contact him via email, his email is: mikejohnsonfirm@yahoo.com, God Bless you like he blessed me with Mr Mike Johnson by getting my loan after been falling in the hands of scams. I would like to inquire about your policy when it comes to maternity benefits. My Girlfriend gave birth to our 2nd daughter last July 12, 2016. She was last employed as a call center agent in one of the bpo companies here in Iloilo, is on AWOL status. Last employment month was April, 2016. Will she still need a certificate of contributions from her company? Or will an affidavit of undertaking be suffice? Thank you and looking forward to your swift reply. hi i’m rochelle.. i gabe birth on Feb. 6, 2016 and i was able to get my maternity reimbursement.. i resigned last Sept. 30 and got my backpay, however they deducted the amount that i got for the maternity reimbursement. is this right? i would really appreciate your reaponse. thanks a lot! goodpm po.. ask ko lang po pwede pa po ba ako magfile ng maternity leave ang due date po ng panganganak ko ay now dec 22, 2016,, kaya lng po last year pa ako nagresign s work april 2015,,may paraan pa po ba para makakuha ako ng maternity leave..maraming salamat po!! reply po kayo..asap..
Bakit po maternity leave and kukunin nyo… instead of Maternity Benefits… and dapat po eh naghulog kayo ng atleast 6 months to avail the Maternity Benefits. Hi tanong ko lang po I already filed mat 1 at mat 2… sabi nila e check ko lmg atm ko after one month… i filed nov.9, 2016 pero till now hindi ko pa rin na rerecieve benefits ko. Ofw po ako at voluntary na naghuhulog. Nagtry po ako magnotify through sss Internet site pero di po gumana ng ilang beses. Sinabihan ko po ang nanay ko na puntahan ang sss office sa Imus para magpatulong kung papaano ito gagawin. Ang sabi po sa desk office no need to notify basta kpag makauwi na po ako sa Pilipinas kailangan ko lang po ng birthcertificate at ultrasound ng bata (kasalukuyang 4 na buwan nang nakakalipas ng manganak ako). Gaano po ito katotoo? Natatakot po ako na baka di ko matanggap amg aking benepisyo ng dahil lamang sa di ko pagnotify sa SSS (I tried many times on their site, but it did not work). Sana matulungan nyo po ako. salamat. I delivered a child last July 12,2016. I passed my maternity 2 in my company, last December I follow-up my maternity in my company, my company says, my papers already give to SSS. But until now the SSS always says “not settle , ask your company if when did they pass your papers, and ask them to give you a transmittal” but my company didn’t give me. please help me to follow-up my maternity because very long time na. good day po… isa po akong OFW and 4 yrs ago hindi na po ako nakakapag hulog sa SSS ko. now i having my 2nd baby. i wanted to know if meron po akong makukuhang maternity benefits even hindi nku nakakpaghulog… ung 1st baby ko po meron akong nakuha….salamat po… since 2004 po ako meron contribution. Hi!i’m not from sss but i have the same scenario with you, the difference is it’s my first baby and i already gave birth. Well, as per sss rules, they require that we have at least 6 contributions prior to being pregnant. Since 2010 ang contribution ko but i was not entitled to any maternity benefits coz i don’t have any contributions before i got pregnant. Sad, but that’s life..hope i was of help to you. Hi good day!. I am browsing your blog and I find it helpful for those mothers like me. I have just a few questions. Am I still qualified for a Maternity Benefit?. I delivered a child last December 8, 2016. Sadly, I have not filed earlier my MAT 1 and also I was separated from my employer last June 1, 2016. But the good thing is I have a contribution from January – May 2016. Hi toni.Buntis po ako 27weeks na. Ang due date ko is on May 20,2017. Sseparated po ako sa work last October 10,2016 pero nahulugan naman ng previous employer ko ang sss ko from july to october 2016.. nagvoluntary pay na ako sa SSS ng November at december 2016. Nagfile po ako ng maternity notification form sa SSS office nung December 13, 2016. Tapos nitong february 7 2017 naemploy po ako for fixed contract 6 months (from feb7 to june 6, 2017.tanong ko lang po, need ko pa ba magsubmit ng maternity notification sa current employer ko? No need, because SSS will only look for your contributions filed from January to December of 2016.
hello. may I ask lang. kasi my employer doesn’t want to give me the advanced maternity benefit pay due to 1 month suspension kasi di ako nakasal agad (yun lang suspension agad) although employed ako. they want me to process it personally after ko nalang daw manganak pero pwede ba yung employed ka then magpapasa ka ng MAT 2 for reimbursement, how are you going to indicate na di naman binigay in advanced yung maternity pay mo? and maaapproved kaya yung MAT 2 application ko? sino po ba dapat magprocess talaga, ako or yung employer ko since employed and status ko pa din sa kanila? and if ever na may approve yung check po ba is mapapadala sa employer? thanks po. sana masagot nyo po because I am really confused. My employer po kasi overlapped the suspension with my maternity leave, sinasadya po ata nila para di kami mabigyan ng leave pay na due to us. No. As long as you’re employed, yung company dapat ang magpasa ng MAT2 mo. And isa pang requirements ng SSS is yung voucher, proof na naiAdvance na sayo ni Employer yung Maternity reimbursement mo bago pa nila ipasa ang MAT2 mo sa SSS. Hello po.Hope you can help regarding my SSSMaternity Benefits.Nag resigned po ako sa work ko Feb 2016 and i gave birth April 2016.I was not able to pass MAT1 to SSS.I worked almost 2 years po sa company and mga 3 years na po ang may hulog sa contribution ko sa SSS dati na po akong member ng SSS.Makiki claim ko pa din po ba ung Benefits ko? Hi! I am a mother of 9,8 and 1 yr old. I was able to avail sss benefit for my youngest. however, i was not able to avail with the first 2. I was employed in a call center for 5 months thus i have paid 5 months sss contribution and then eventually transferred to the government. my question is can i still avail the ss benefit for my first two children? hi i would like to ask if pwede ko pa ma claim ang maternity benefit ko, mag 6 years old na ang anak ko this december 2017..
Hello Ms. Toni.. I just want to clarify,,kasi naghuhulog ako voluntary contibution..last hulog ko october,november,december 2012..nanganak ako 2013 ng Mat..di ko nman alam na covered pala ko ng maternity benefits.. Can I still file kaya??? Good Day po! Tanong ko lang po, may history po kasi ng miscarriage pero hindi ko po ito na ifile sa sss. Ngayon po may 3kids na ako, and ngayon po ay buntis. Pwede ko pa po ba ito ifile sa maternity benefits?? Nung nag file po kasi ako sa third baby ko nailagay ko po sa maternity notification ay fourth pregnancy na, then nung nagcheck po ng sss ko online nakita ko po dun na ang record ko is 3rd pa lng. Ihahabol ko po sana kasi ifile itong pinagbubuntis ko ngayon. Salamat po sa mga tutugon. Hi tanong ko lang po if I can still avail the Maternity Benefits. 7 months na po akong pregnant pero hindi pa ako nakapag file ng MAT1. Pwede pa po bang maka pag process nang MAT1? EDC ko is August 23.
hello goodmorning ijust have to ask if i can avail the maternity benefits if my last contribution is up to march 2017 and my expected delivery date is on dec 2017.. or will i have to continue my contribution to be qualified..thank you i am hoping for answers. Hi,I just want to ask. I gave birth last Dec 2011, before that I have 3 months contribution with SSS. July, Aug, Sept of 2011. Then starting 2012 until today 2017, I’m paying my monthly contribution already. Will I still be qualified for maternity claim? Thanks. Buntis po ako 5 months na, ang due date ko sa Oct 27, 2017. Pwede pa po ba ako mag file ng Maternity kahit 5 months na ako. Also, RS-1 lang po ang meron ako wala po akong SSS ID. hi!i just wanna ask.. kase my expected delivery will be on last week of November to December 1st week this year.. i resigned from my previous job last September 2016 so my last contribution from them was September 2016 then i got hired again the same month here at my present job. The problem is that my monthly contribution starts again only this year January 2017. And now my question is ilang months ung gagamitin ko sa monthly salary credit ko since hindi nahulugan yung from September 2016- December 2016 ko. Thank you in advance. Hi! I just want to know po if I could still notify to the sss even if I am 6 months pregnant ang if I could still avail the maternity benefits kahit po past 1 year n po ako Hindi nkahulog s sss ko po? Hope to hear it from you.. Thank you so much.. Please give me some advice, nagsubmit na employer ko ng Notification sa SSS then after 3 months 2 days before mag 4 months baby ko nawalan ng heartbeat. Niraspa ako at inadvance ng employer ko is 16k lang kasi 1 month lang binigay ng boss ko sakin pero nung tinanong ko sa SSS ang minimum daw na Mat leave sa Miscarriage is 2 months, so dapat ang makukuha ko is 32k , kaso pumasok na ko agad after 1 month. Sabi ng admin namin paguusapan pa daw kung ano mangyayari kasi di pa narereimburse sa kanila. Makukuha ko pa ba ung half nung 32k kahit 1 month lang ako nagleave? please help nyo naman ako. Makaka avail pa po ba ko kahit mag to 2years.old na yung baby ko?I gave birth February 4,2016.pero Hindi ako naka pag file ng mat.benefit Kasi Kulang daw yung hulog ko.pero na update ko na xa ngayon.my contribution is from January -April 2015..pued pa ba mama avail?thank you so much! ask lang po ako makaka aviel pa po ba ako kahit 4 years old na anak ko? i gave birth dec. 02,2013 at ng resign na ako sa work july 2012. at ngayun bumalik na ako sa work at contenue na ang hulog ko. hi I would like to ask if how long does it takes to receive the maternity claim in SSS? will it takes weeks or months? hi good day po. as ko lang kasi when i got separated from my company a year after i gave birth binaliwala ko mag claim ng maternity benifits and after ten years i attempted to ask the sss if i can still claim it sabi hindi na puede mam kasi ten years na. umalis nalang ako so sad. wala na bang pag-asa ma claim ko benifits ko? for single parent sake — thank you po. from a single parent of cdo misamis oriental. I am 28 weeks pregnant…My expected date is May 3, 2018… I was not able to file MAT1 yet because of my condition. I am planning to file within this week. Can I still avail it or apply the maternity benefits? Which is more better? MAT1 OR MATERNITY BENEFITS for immediate resign??? Hi poh ask q lng kung mkakapagfile p poh b aq ng maternity khit n nkapanganak nq ?at my 6months poh aqng contribution mula oct.2016 to march 2017 nanganak po aq ng dec.2017 pwede p poh kya aq mkakuha sa maternity? hi , im loveyask ko lang kse 1 month nah aq naoperahan dhil ectopic pregnancy po aq kso ung employer ko ayaw nah iprocess ung sss maternity q dhil sa d daw nla narreimburse sa sss .. gusto nla ung 78 days sshod nlang daw aq habang nkaleave cla nah daw mgbbyad pro d nla ipprocess sss q ok lang po b un or hindi ? lugi po b aq dun ? mkkdemand po b aq d pmayag at ipprocess ung sa sss ko ? Hi I’m Belle and 17 weeks pregnant, and nag leave po ako ng 2 months (February – March). Bale ung 1 month ko is cover pa ng SL and VL ko tapos ung 1 month is wala na. So nagpa fit to work ako nung march 29 and nagpa ultrasound na din para mag submit ng sss sickness. Pero nung nag duty ako nitong April 2 sabi late na daw kaya wala daw ako makukuha na sahod for the whole month. Pwede pa kaya ihabol po yon? Pde Po bang makakuha Ng benepisyo Ng SSS kht Indi pa nakapagtrabho ,pero maghuhulog? Pwede pa ba ma avail ang maternity benefits kahit nanganak na po? Anu ano po mga kailangan? Wala na po work. Pls help me po. hi im currently 7 months pregnant and last contribution ko s sss ay september 2017 tpos n awol nko and wala n balak bumalik p s company to claim anything from them pero alam ko nung nagwowork ako dun nhulugan nmn sss ko for 1 year and six months due date ko n po is october 13 pde p po b ako magfile ng sss benefit ko? Hi good day.. Tanung lang po nag pasa na po konng mat 1 sa hr nmen at ultrasound kaso nung pinasa po sa sss sabi po not qualified dw po ako kc wla dw po ko hulong sa sss ko nung 2017 from january to August nag start po ko mag work sa pinapasokan ko ngyn sept 25, 2017 to present na nganak po ko ng oct 25, 2018 un din ang 1st day leave ko.. Kaso po d na ko naka pag pasa ng mat 2 dhil d na po ko na bigyan ng form ng hr nmen hanggang sa maka panganak na po ako.. May makukuha pa po ba ko sa sss kong now ko po cya aayosin at kong hnd nman nga dw po ko qualified????? At least 60 days after conception po ‘yung rule, ibig sabihin di po ba na kahit lampas na ng 60 days ay pwedi pa? Hangang kailan po pa yung maximum time given to inform the employer? Salamat! pwede ko po bang isabay ifile ang mat1 and mat2 ?